Johnson's Ireland. / Johnson's Scotland. 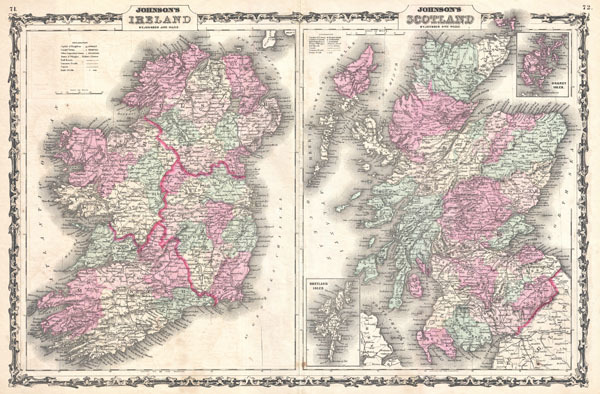 A very beautiful example of Johnson's 1862 map of Scotland and Ireland. This two part map details all of Scotland and Ireland with insets of the Shetland Islands and the Orkney Islands. Both maps are color coded according to county and region. Ireland is divided into its four primary provinces, Munster, Ulster, Connaught and Leinster. Features the strapwork style border common to Johnson's atlas work from 1860 to 1863. Published by A. J. Johnson and Ward as plate numbers 71-72 in the 1862 edition of Johnson's New Illustrated Family Atlas. This is the first edition of the Family Atlas to bear the Johnson and Ward imprint. Rumsey 2905.041 (1860 edition). Phillips (Atlases) 6140.